Puzzle Puppers. Now there’s a name for the meme generation. A name that tries to say a lot about the game it represents in as few syllables as possible. Hearing that name evokes expressions of joy and wet-eyed love because doggos and puppers are so good, etc. So, you’d be forgiven if, upon starting this puzzle game, you find it a bit of a letdown. This is, like so many other games heading onto the Nintendo eShop at the moment, is just another title suited to the forgettable touch screen generation of mobile games. That’s not to say it’s a bad game, but the teased saccharine cuteness is entirely missing and the game itself is a re-skinned version of so many that have come before. The premise is thus; get the dogs to their bowls of food. However, the dogs can’t move their bottoms from the starting position on the puzzle grid. They stretch like a Doctor Moreau sausage dog, their stomachs are endless noodles that need to be guided and tangled with other dogs of other colours. 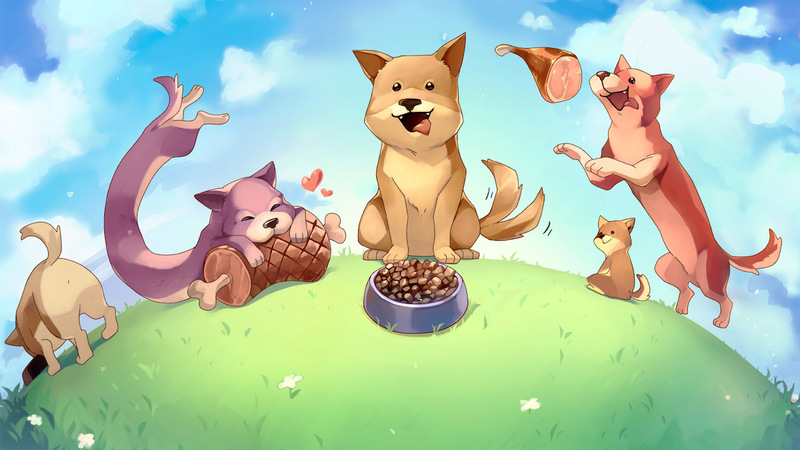 Along the routes are random numbers of hams which require collecting, because these are very hungry Puzzle Puppers and this facilitates a star rating out of three for each level. There are many different coloured dogs introduced – not breeds, colours, because adding breeds would have made it actually adorable. Soon there are water-based conveyor belts that alter the direction of movement, there are holes that the dogs can enter and exit in a very different place on the grid akin to a Caddyshack Gopher. The set up for each of the puzzles is actually quite interesting and the introduction of new features keeps the game refreshing. But, there are only so many levels – under 100 – some unlocked by collecting those hams, and with an absence of charm, the game soon runs out of steam. The style is lacklustre, the sound design adds very little to the overall package and it all feels very bland. This is one of those games where, when it loads I found myself uttering ‘Oh’ out loud, because it failed to capture any part of me. Had there been some humorous narrative, a few jokes scattered throughout, maybe even just some puns, I might have enjoyed my time with Puzzle Puppers. As it stands, it’s completely forgettable, which is a massive shame considering the wealth of memes and jokes that exist and the fact that the actual puzzle design is decent.